Its been a while since we tried the AC and RC booster, They took us all by surprise and I think these two pedals set a whole new standard to the pedal industry. They are stunning, and to my ears they are good contributors to the modern guitar history. The whole concept is award winning, a VERY good sounding product and a management that love what they are doing! So when the BB preamp was announced our expectation was pretty high. And Xotic pedals didn’t put us down this time either. The BB preamp share all the good options and features as her big sisters. The BB preamp is hand wired, true by pass and of course it has the lovely Xotic pedal EQ. ON top of that, this baby is equipped with and extra gain stage in the preamp that makes this pedal scream like a new born…If you like it to. I first tried the BB preamp with my -67 Tele into a Mystic Blues amp. I started with a low gain setting and the pedal sounds just as transparent as the AC and RC boosters. So it passed the Xotic standard setting easily and I could have stopped here and still be VERY satisfied. But I couldn’t stay away from the gain knob! I turn the knob and the tone transformed from clean to a mean, singing lead tone. My Tele is no heavy metal guitar, but I still got nice fat sound with lot of sustain. I just had to try this pedal with my les Paul. Man, with the humbuckers, I had a sound range that took me from Carlton to Gary Moore just by changing the way a hit the strings. The sound is nicely compressed and the sustain is stunning. Hit a note and just lean back. It will ring for hours! Even though other pedals that are transparent could be a bit hard to play through, the BB preamps compression on higher gain setting lets you get away with some minor mistakes in your killer chops. The pedal worked really well with single coils, but even better with humbuckers through my amp. OK, so the lead tone is killer….what about the rhythm playing? I would say that the BB preamp acts like a good tube amp. With high gain settings you get this smooth, signing tone that is not always the best for rhythm playing. But with the BB preamp you can easily adjust the tone and gain amount with the volume on your guitar. From LA to UK, just turn that knob of yours! I found that the BB preamp did sound best in “Fender type” amps. I felt that it’s a bit to much together with an Marshall., but hey that’s my taste! 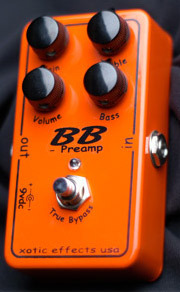 If you are looking for screaming lead tone and smooth singing sustain, you should really try the BB preamp. But don’t forget to try the AC and RC while you’re at it. Xotic pedals will improve your tone for sure!